Leaving Coos Canyon and Byron - as well as hopefully the rain! - behind, we continued heading south on Route 17 where we eventually passed through Mexico (Maine!) and ended up in Rumford which was the first big town that we'd seen in Maine. 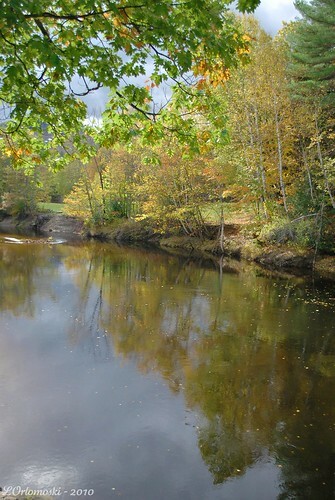 Located in the foothills of the White Mountains along the banks of the Androscoggin River, the township was originally known as New Pennacook Plantation when it was granted in 1779 to Timothy Walker, Jr. and associates of Concord, New Hampshire by Governor Benning Wentworth as the result of a border adjustment following a bitter dispute between Concord and its neighboring town of Bow. I guess back then if you didn't get along with your neighbors, it was a lot easier to just be granted new land and move elsewhere what with their being so much property available to be taken away from the Native Americans who had lived on it long, long, long before my ancestors got here - something I'm not particularly proud of. 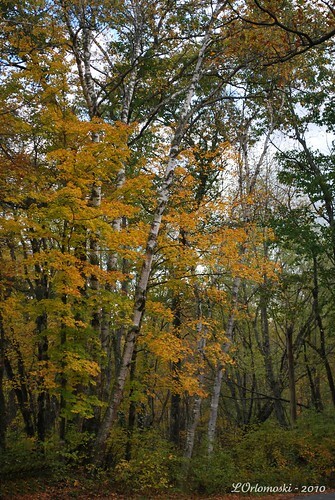 The town was incorporated in 1800 at which time the name was changed to Rumford - a source of some debate. Some say that the name came from one of the original names of Concord which was what it was called when it was incorporated on February 9th, 1734 but others contend that it was named after Sir Benjamin Thompson, Count Rumford who served as a Colonel in the Loyalist forces in America during the American Revolutionary War. Now I'm no expert but I'm thinking that a New England town probably was not named for a British Loyalist in 1800 so I believe the name derived from the original settlers' Concord roots - though I could be wrong as the Count's portrait can be seen in the Rumford town hall. Hmmm ... I guess we'll never know! At any rate, I didn't see any statues of Count Rumford while we were in town but I did see this big fella here who was standing in front of the local visitor's center holding a large ax ... a VERY large ax! 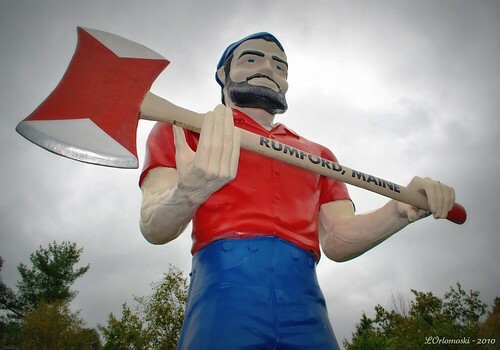 I'm not exactly sure why Paul Bunyan was standing guard over the Rumford Information Center as legend has it that Paul Bunyan was born in Bangor and we were nowhere near Bangor what with it being a little over 100 miles to the east of Rumford but there he was. According to a sign out front, Babe the Blue Ox was located down the road a piece; I'm sure Paul could see him from where he was standing! 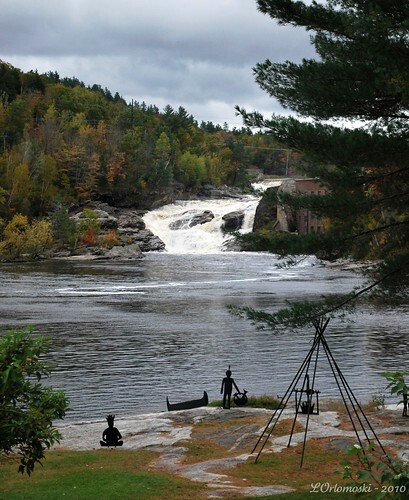 In addition to the large man yielding the large ax, the River Valley Information Center had a wonderful view of the Upper Falls section of Pennacook Falls where the Androscoggin River drops 177 feet over solid granite. 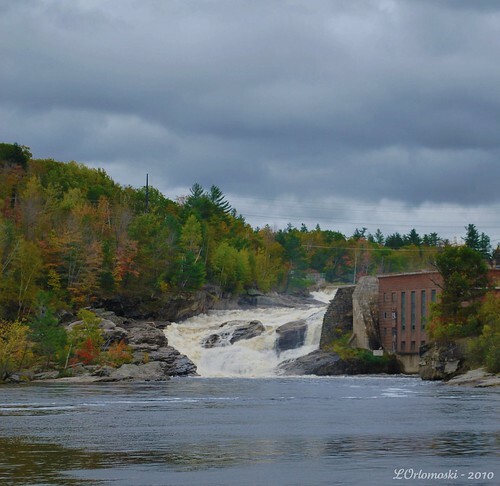 Also known as the Great Falls and Rumford Falls, they are the highest falls east of Niagra Falls and were put to use long ago to power what was at one time the largest paper factory under one roof in the world - the Oxford Paper Company which is now the Rumford Paper Company. 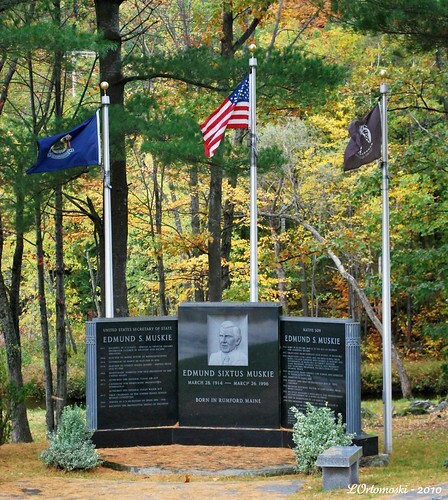 There's also a monument to commemorate one of Rumford's more famous native sons - Edmund Sixtus Muskie who was the 64th Governor of Maine, a U.S. Senator, and the 58th U.S. Secretary of State during the Carter Administration. Muskie was the Democratic nominee for Vice President in 1968 and was a candidate for the 1972 Democratic presidential nomination which eventually went to Senator George McGovern. 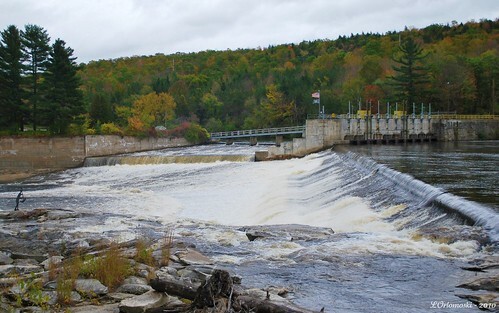 Not being all that interested in politics, I found the river and the dam to be much more interesting! Before I continue on our journey just as an aside, should you ever find yourself in Maine on the 4th of July, Rumford holds the largest fireworks display in the state of Maine during their annual Moontide Water Festival - perhaps you'd like to join the 45,000 to 50,000 people who attend the show! Putting Rumford in the rear view mirror I picked up Route 2 west out of town and started back towards Bethel where it looked like maybe - just maybe - the sun was going to make an appearance finally! 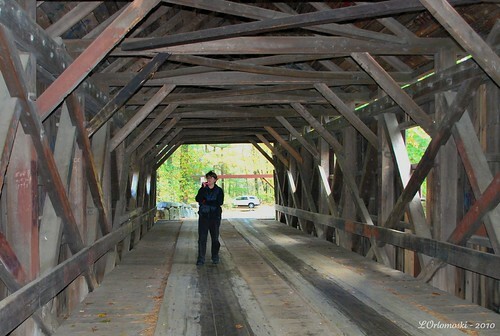 Knowing there was one more covered bridge in the area, we took a side trip over to Andover but on the way we came upon something that I never expected to see in Maine. Yep, that right there would be a buffalo or I guess it could also be a bison - either way, it sure the heck wasn't a cow or horse and I sure wasn't expecting to see a herd of them so close to the road ... safely behind an electric fence of course! I pulled the car over to the shoulder and Jamie and I got out to take a few pictures. Being a major animal lover, Jamie seemed a lot more excited to see the buffalo then she did any of the covered bridges we'd seen that morning! I guess I can't blame her, they were pretty impressive even from a safe distance way across the street. Hey, you never know when there's going to be a power outage! 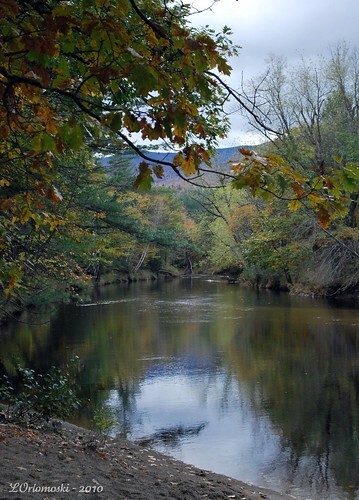 Continuing on through the Maine countryside, very shortly after we left the buffalo we came upon the Ellis River which - if you look at a map - has got to be one of the most crooked rivers ever! 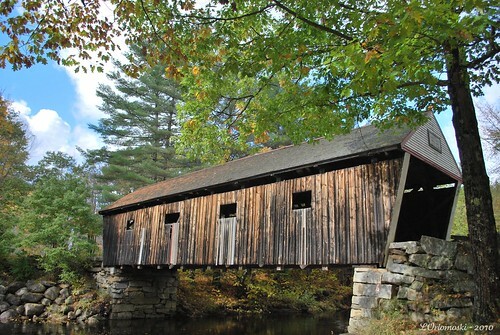 It's over this part of the Ellis River in Andover, Maine that you'll find the shortest of Maine's historic wooden covered bridges - the Lovejoy Bridge. 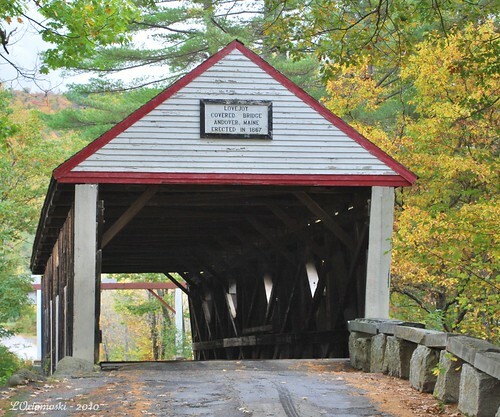 Built in 1868 and costing $743.45 which was raised by taxing the townspeople, the bridge is only 70 feet long but it sits up pretty high over the river. I'm pretty happy with this shot above as I didn't do a thing to it at all as far as editing goes other than to add my name in the right-hand corner. Not bad, eh? Every great once in awhile I get a shot like that which makes me think I'm getting a'ight with this photography stuff! And yes, ladies and gentlemen, that's the sun you see reflected in this picture of the Ellis River! About time, eh? Like the other two bridges I've written about, the Lovejoy Bridge is also constructed in the Paddleford truss design and it too was listed on the National Register of Historic Places on February 16th, 1970. After a heavy sand truck tried to cross the span in 1983 and crashed through the floor into the river, the bridge was repaired and reopened in 1984 with a reinforced deck and height barriers which are sometimes referred to as "headache bars" placed at the entrances of the bridge to prevent oversize vehicles from trying to cross. You can see one in the distance behind Jamie - who was carrying her camera and not her skunk this time! 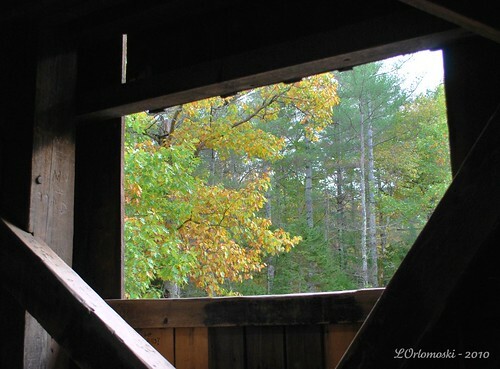 So, I'd found the last covered bridge in the area, we'd done the drive through Grafton Notch State Park and the Rangeley Lakes region, the sun had finally come out, and it was only about 2:30 in the afternoon and way too early to go back to The Chapman Inn. I needed a plan but luckily I had one ... I'll tell ya about it next time! 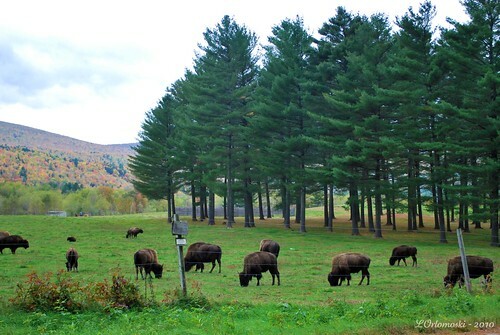 Aren't Buffalo/Bison fascinating? They are so majestic. I'm giggling at the Paul Bunyan statue. Hubby named his big blue pickup truck, "Babe the Blue Ox" after his legendary sidekick. 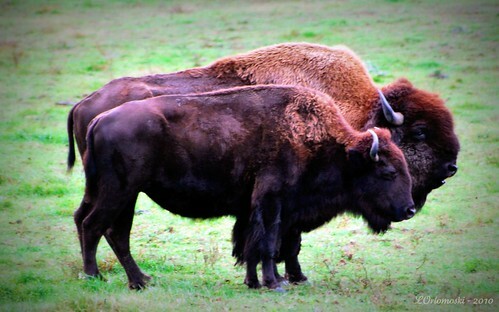 Maybe Babe was really a bison? Linda, you would do well writing in National Geographic or a travel magazine. What a fun trip and you got some fantastic photographs to prove it. Way cool. Thanks for taking me along. 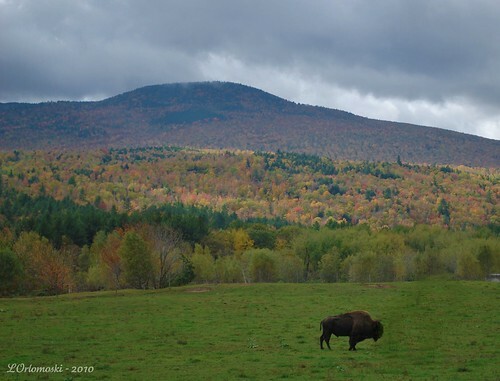 Buffalo in Maine? There was a place around here in Hicksville who had a few years back. all gone now, or I've forgotten where I saw them. wonderful! and i LOVE the new header too. amazing shot! I was so fascinated with Paul Bunyan as a kid. Someone read me the story and I actually though that he was real. Great photos. Have a lovely week, Linda. What a fun trip. Thanks for letting us tag along. Like the new background, BTW. Those buffalo was a neat stumble upon! Very cool. I do remember Muskie, vaguely. It was just about the time I started taking civics. Yawn. Rain or not, you got some wonderful shots! I'd certainly say you're doing a'ight! The Paul Bunyan statue reminded me of the location of "The Exact Center of California". 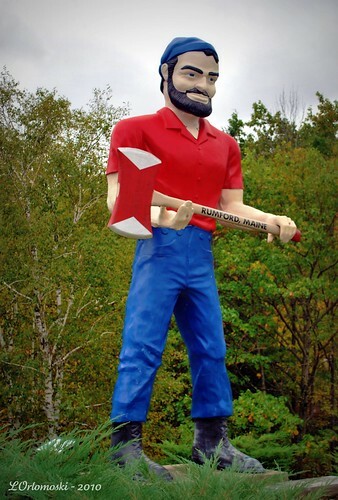 Every year North Fork has a Paul Bunyan festival complete with logging events. Every day during the festival Paul Bunyan walks through town, unfortunately no one ever sees him, but on the main street of town there are "footprints" from Paul and "oxprints" from Babe. The waterfall looked familiar. But a bit different at the same time. 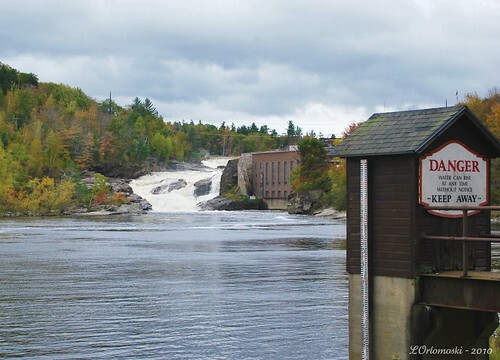 I will have to go through my Maine pics to see if we were indeed in the same town. I had found a similar scene when we took a detour to a town that had a pawn shop for hubby to explore.